Kishor Alo June 2016 free ebook pdf file. 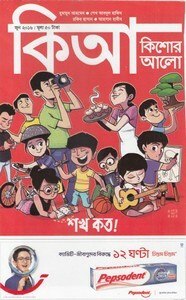 Kishor Alo is the greatest popular Bangla monthly magazine by Prothom Alo from Bangladesh. You can get a pdf copy of edition March 2016. This edition inner stories are about the subjects- Theatricals world, Teenage Poetry, Stories, Not rumors, Serial novels, comics, Translated story, technology, history etc. All little blog viewers can Read, View or Collect pdf of Kishor Alo June 2016 edition.